Do you want to have the top electronic billboard in Dixon? Veale Outdoor Advertising can help you find one or more of the I 80 billboards that will take your business, event, or cause to the next level. We offer options for both traditional static and modern digital billboards that will help you get your message out to millions of commuters each month. We can help you have one of the top billboards that is eye-catching and motivates the viewer to take action. 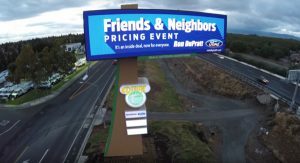 Veale Outdoor Advertising has been serving local businesses since the 1980s, and we are proud to be the top electronic billboard company in Dixon. By placing an electronic billboard amongst the I 80 billboards, you have a significant edge over businesses that opt for static billboards. More people will notice your message, which can be continuously updated as you need. For example, if you want to advertise a weekly sale, you can update your message as often as you need, as opposed to an uneditable upon completion static billboard. The electronic billboard signs on I 80 are passed by thousands of commuters each day that will quickly learn about your business, event, or sale. Research indicates that commuters who travel long distances are more likely to make a high level of income, meaning that are an attractive demographic to which you can advertise. Contact the experts at Veale Outdoor Advertising when you are ready to secure the top electronic billboard in Dixon. We will work directly with you to learn you specific needs, ensuring your final result is of the highest quality.